The Netherlands’ house prices continue to rise strongly, mainly due to robust demand, coupled with lack of adequate housing supply in the market. The average purchase price of all dwellings rose by 8.45% during the year to Q3 2018, slightly up from the previous year’s 8.23% growth. On a quarterly basis, house prices were up 0.42% during the latest quarter. During 2017, there were 241,860 houses sold, an increase of almost 13% from a year earlier, according to Statistics Netherlands (CBS). The strong demand was fuelled by low interest rates, as well as strong economic growth. However in the first three quarters of 2018, home sales dropped 7.8% from a year earlier to 161,956 units, mainly due to worsening supply shortages. 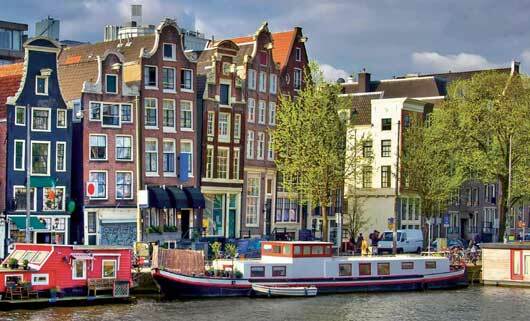 Amsterdam apartment costs are around €6,900 per sq. m.
Recent news: The Dutch economy grew by 2.9% in 2017, the highest growth since 2007, amidst strong investments and exports, according to the CBS. The Netherlands' GDP is expected to grow by another 2.8% this year and by 2.6% in 2019, according to the IMF.